The Art Inspired Jewelry® line is a unique combination of Art and Jewelry, both created by Artist- Metalist Susan P. Foster. The original drawings or paintings inspired Foster to make a piece to coordinate art and jewelry. The pieces are cast in sterling silver or 14k yellow gold. The pieces are boxed with a gift enclosure card to allow the recipient to see what inspired the jewelry piece. 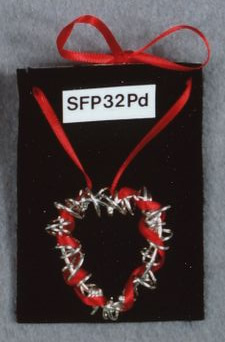 Most of the pieces may be worn 2 different ways – as a pin and as a pendant.Foster has been a customer with the Cranston Casting Company (http://www.cranstoncasting.com) for almost 40 years. Susan says, "They are the best in the industry. Professional, artists at the work they do, honest, and craftsmen in their own right." They do all the molds and castings for pieces Foster does not hand make herself. This creates a better price for the customer, but loses nothing in the quality or value in the pieces. On their website, you will see the entire casting process, which is one the Egyptians used.